Jason Cowley comes under pressure on the ball as the Victoria Ground faithful watch on. Picture by Geoff Hawkesworth. Bromsgrove Sporting were unable to notch up their tenth win in a row on Saturday afternoon, as they drew 2-2 with Barton Rovers. 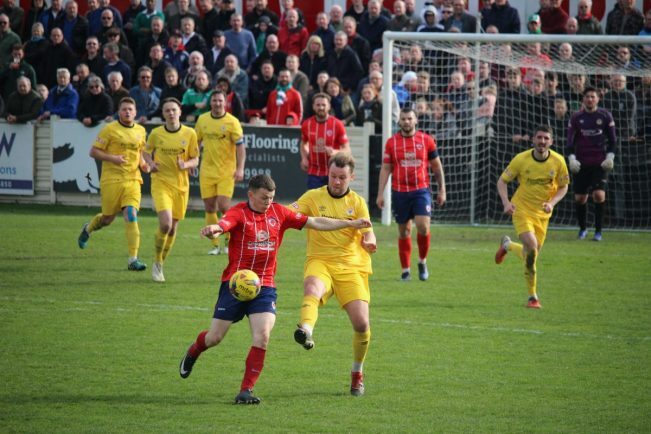 Josh Quaynor bagged the Rouslers’ 100th league goal of the season with a well-taken first-half effort, before a Richard Gregory penalty just shy of the hour mark made it appear as though Bromsgrove were well on their way to another win. Barton almost opened their account for the afternoon just three minutes in, when Williams Jr broke through the defence and saw his shot saved by the feet of Jono Brown. Charlie Dowd nearly gave Sporting the lead on the 16th minute, but his effort was saved at the near post. Further chances would fall for Westwood, after he had a header saved by keeper Garry Malone before his rebound effort was blocked by a Barton defender. Sporting looked as though they would cruise to another victory when their second came 13 minutes into the second half, with Gregory emphatically slamming home a penalty into the top corner, following after a handball offence. Then, just a minute later, Osubu willfully pounced on some equally haphazard defensive play to dispatch a one-on-one past Brown. Bromsgrove had chances to take all three points thereafter, with a free kick by Gregory that was hit narrowly wide probably being the best of the chances – but this was far from a vintage display from the home side. Barton themselves had opportunities to bag the win, with Andrew Phillips having a shot at the front post smartly saved by the feet of Brown, but both sides played out for a point apiece.